“Jason Van Dyke’s sentence only further exposes the injustice that is inherent in our criminal justice system. “The biggest issue with this sentence is the double standard. Had Van Dyke been someone different – for example, a young black person – he’d have gotten a much longer, much harsher sentence, but because he has the privilege of being a white police officer, he has gotten a slap on the wrist. “That issue never really gets addressed. Whenever an officer avoids consequences of killing an unarmed black person, there’s outrage, but we should not limit the outrage to days when the wrongful killing of a black person is met with indifference in court. We must be outraged and maintain our outrage at the system and the double standard that exists to allow the lack of consequences in the first place. SPRINGFIELD — State Senator Robert Peters (D-Chicago) joined colleagues on Wednesday to be sworn in to the Illinois State Senate, replacing former Senator Kwame Raoul. Peters is a former community organizer who was born and raised on Chicago’s South Side. He overcame immense personal hurdles in his early life, having been born deaf and with a speech impediment, and credits his community for never letting him down. Peters has also been named secretary for the Illinois Legislative Black Caucus. He will represent the 13th Senate District, which stretches along Lake Michigan from downtown Chicago through the South Side. For more information on Senator Peters and to contact him, visit his website at www.senatorrobertpeters.com. 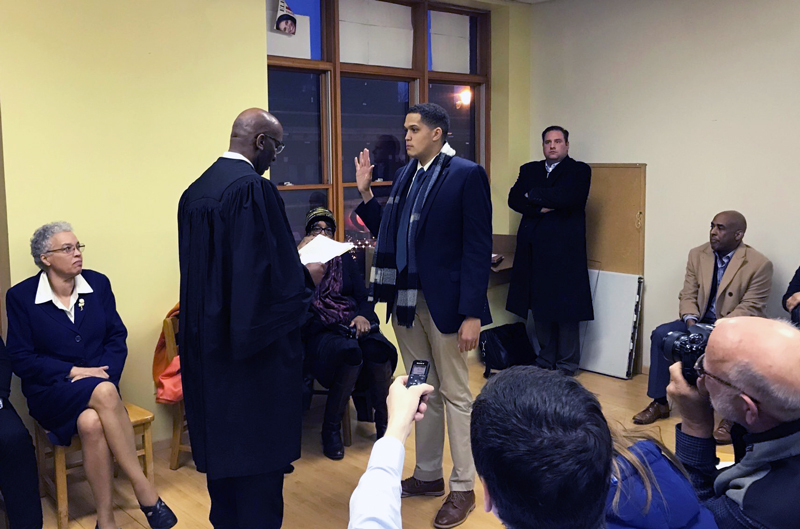 SPRINGFIELD – State Senator Robert Peters (D-Chicago) was sworn in to the Illinois Senate on Sunday, Jan. 6, to fill the seat vacated by Attorney General-elect Kwame Raoul. Peters is a political activist born and raised on the South Side of Chicago. He was born deaf and with a speech impediment, to a biological mother who was addicted to drugs and alcohol. He credits his experience being raised by his adopted mother, a social worker, and father, a civil rights lawyer, for his passion for public service.